Summer Camp and Retreat Centers have the difficult job of being the ultimate in flexible use spaces. Transforming group rooms from a meeting space, into an...activity space, into a worship space, and then into a communal dining space needs to happen quickly to keep customers, campers and staff happy and comfortable.The task is not a small one and having the right furniture that is durable, easy to store and easy to move is essential. Having had the privilege of having talked to hundreds of camp and retreat center directors and staff, we have compiled a list of the 8 pieces of furniture that camp staff can't live without! Wood Framed Sofa, Loveseat and Lounge Chairs. Frequently called Crate-Style or Tough Stuff furniture, seating pieces with exposed wood frames and replaceable cushions offers durability that stands up to heavy use. Having a seating area that is sturdy and comfortable is the hallmark of the camp and retreat meeting space and most often remains a stationary, focal point of the group room. Folding tables. Retreat leaders in particular have a broad repe rtoire of activities and lessons that require hard surfaces for art-oriented projects, artifacts from nature, displays, books, supplies; the list goes on and on. 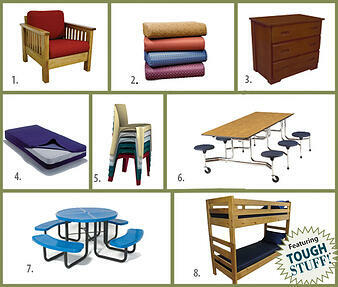 Having tables available that can be easily folded and stored when not needed is a camp and retreat essential! Wood Dressers and Night Stands. As groups come and go furniture can really takes a beating. Solid wood dressers, night stands, stack cubbies and other storage pieces keeps clothes and other essentials off the sleeping quarter floors and help groups feel settled and organized during their stays. Solid wood pieces with wood or laminate tops are heavy-duty, durable and stand up to many years of use. Fluid-Proof Mattresses. Nylon or soft, pliable vinyl mattress covers offer great protection from spilled drinks. Even occasional incontinence can be effectively managed with fluid-resistant or fluid-proof mattresses. Foam or fiber cores are affordably priced and are a great sleeping solution for large groups. One Piece Molded Chairs and Metal Frame Stack Chairs. One-piece molded chairs are light-weight but highly durably for consumers of any size or shape. Rated for static weight up to 1200 lb., one-piece molded chairs can take the most extreme use without chipping or breaking. Metal frame stack chairs with upholstered seats and backs are a more traditional solution that offer flexibility and durability. Crate-Style or Tough Stuff Furniture (see above) has easily replaceable cushions that can be changed out due to wear or to keep up with fashion trends. Replacing cushions is an inexpensive way to keep frequently used seating pieces fresh and looking good. Outdoor Tables Fresh air and sunshine provide the best opportunities for group bonding and learning? Outdoor wood or plastic coated metal tables and benches are great for dining or activities. Outdoor chairs can make any space a meeting or worship space. Bunk beds. Perhaps the most important asset of any camp or retreat center (after the staff, of course!) is the bunk beds! Solid wood, well-constructed, long-lasting bunk beds provide campers and guests with a well-needed place to sleep and recharge from the day’s activities. Narrower 30” wide options offer the most space-efficient sleep spaces and more traditional twin sizes (36” and 39” wide) keep guests feeling even more at home. When planning new furniture for your camp and retreat center always choose a furniture provider who understands the needs of your campers and guests and has offering that will be durable and appropriate.